Critical illness can strike whenever, given how prevalent nowadays. This is because chances of you getting a critical illness increases as you live longer. When it happens, you’d need time to recover from the illness. Critical illness plans pay a lump sum of money to help you cope with recovery during the period when you are not working. However, while traditional critical illness plans pay out only in the event that you get a late stage critical illness, new innovative plans like early critical illness plans and multi-pay plans have emerged. In this article, fundMyLife reviews AXA Early Stage CritiCare and explores its notable features. Note: this article is accurate as of Oct 2018. In contrast to AXA CritiCare for Her/Him, AXA Early Stage CritiCare (despite its name) is a critical illness plan that covers early, intermediate, late, and terminal critical illnesses. We wrote about AXA CritiCare for Her/Him – you can read it here. The coverage of the plan is until the age of 75. 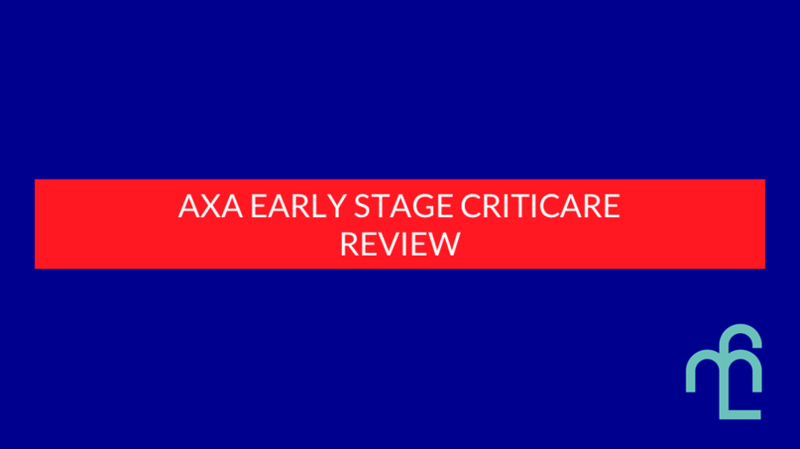 A summary of the main benefits of AXA Early Stage CritiCare. Source: AXA. According to the product information, the plan pays out for not only early, intermediate, and advance stage critical illness, but also terminal stage as well. For example, the last benefit kicks in when you get terminal stage cancer. Under the terminal illness benefit, it says that you will get “150% of the Sum Assured minus all previous claims paid”. 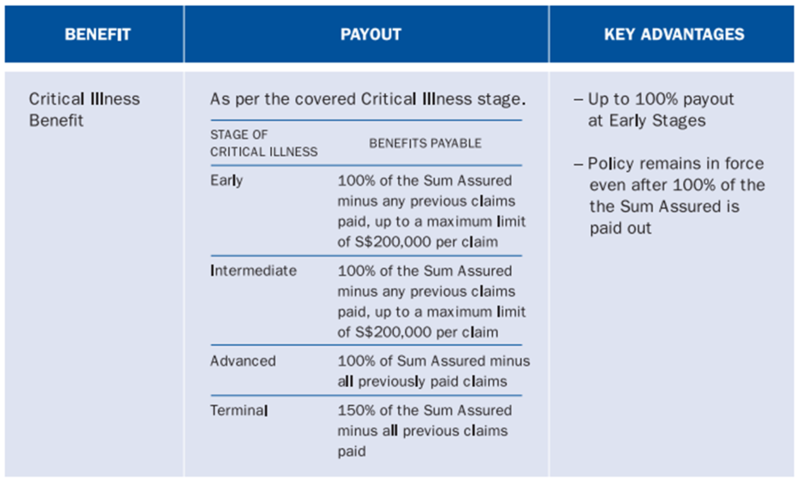 As such, if you made a prior claim under either early, intermediate, or advanced stage critical illness, you’d get only 150-100 = 50% of the sum assured. It is most likely that you will get 150% of sum assured, since most sum assured are usually between $50,000 to $100,000. This is aside from the additional benefits that is included in the plan, of course. After your first claim, the plan reimburses you for your health checkups. Under this benefit, you can claim up to $2,500 per health checkup per policy year, to a maximum of $7,500. This implies you can have three of theses benefits. Presumably, this feature encourages you to undergo regular health checkups to avoid the worsening of your health. This is especially useful for cancer patients, when cancer patients can experience a relapse within a few years. Catching relapses early can mean between curable and non-curable. How it works is that when you contract these conditions, you receive either %10 of your sum assured or $25,000, whichever is lower. It means that if your sum assured is $100,000 and you get dengue, you’d receive $10,000 (10% of $100,000). On the other hand, if your sum assured was $300,000 and you got the same disease, you’d receive $25,000 (the maximum) instead of $30,000 (10% of $300,000). You can only claim once per condition, i.e. you may receive 5 times from this benefits. After your first successful claim, all future premiums are waived for the rest of your policy duration. Note that for Plans 1-4, you have to have at least $300,000 as sum assured. Wew, what a feature packed product. Given that the plan works on a deduction basis, if your sum assured is lower than the maximum per stage, i.e. $200,000 and below, you’d be done after claiming 150% as advertised most of the time. This plan is also good as a complementary plan to your AXA plans since there is discount when you buy them together. Presumably, it encourages consumers to stick to AXA and get purchase other plans as well. However, with only five conditions covered under its special condition benefits, there is less coverage for special conditions compared to other plans out there. One caveat, if you’re price conscious. The AXA Early Stage CritiCare is relatively more expensive if you compare it to other multi-pay plans out there. However, it’s best to check with a financial adviser if this plan is suitable for you. There you have it, the AXA Early Stage CritiCare in a nutshell. We hope that this article helped in clarifying what it is and its various features. Do consider it and approach your financial adviser if you’re interest in it!